In this definitive biography of Joy Davidman, we read the real love story that the major motion picture, Shadowlands, could not tell. Lyle Dorsett reveals Davidman's profound influence on C.S. Lewis's life and writings.Helen Joy Davidman (1915-1960) was an American poet and writer, a radical communist, and an atheist until her conversion to Christianity in the late 1940s. Her first husband was the writer William Lindsay Gresham. Her second marriage was to the writer and Oxford don, C. S. Lewis. Joy separated from her first husband and moved to England in 1954 with her two sons, David and Douglas Gresham. Lewis at first regarded her as an agreeable intellectual companion and personal friend, and it was at least overtly on this level that he agreed to enter into a civil marriage contract with her so that she could continue to live in the UK. It then became clear that she had terminal bone cancer, and the relationship developed to the point that they sought a Christian marriage in 1956. She recovered briefly, but eventually succumbed to cancer. Lewis wrote A Grief Observed in response to her death. Who was the outspoken, dynamic woman named Joy who became C. S. Lewis's wife? The popular movie Shadowlandstells part of the story, but the woman who came from New York with her two children was still an enigma, until Lewis expert and archivist Lyle Dorsett undertook to look into the life and character of this unusual woman. 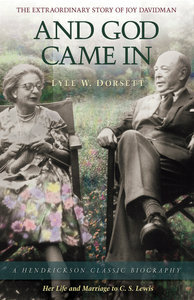 And God Came Intells a more complete story, not only about the brief marriage between the erudite and accomplished Lewis and Joy Davidman, but also of the famously vivid and assertive woman herself. About "God Came In, and"
Lyle W. Dorsett (Ph.D., University of Missouri-Columbia) is Professor of Christian Formation and Ministry at Wheaton College and is also Billy Graham Professor of Evangelism at Beeson Divinity School. He is the founding pastor of Church of the Great Shepherd in Wheaton, Illinois, where Lyle now volunteers as part of the ministry team. Lyle Dorsett has a keen interest in History,especially in the history of the care of souls, evangelism and revival. He is the author of eighteen books, among them several Christian biographies and three works on C. S. Lewis. His most recent book is A Love Observed: Joy Davidman's Life and Marriage to C.S. Lewis, Seeking the Secret Place: The Spiritual Formation of C. S. Lewis and A Passion for Souls: The Life of D.L. Moody.